One of the more the more ingenious accomplishments by the globalist hegemony is convincing a huge swathe of the population that by aligning themselves with these ruthlessly exploitative corporations that one is “#Resisting” the Establishment. Amazon, for example, has a larger net worth than all but sixteen countries on earth. We are fast approaching a time—if we are not already there—where the corporatocracy is more powerful than the nation-state. Certainly, global finance is already there (what, you thought the Federal Reserve was actually controlled by the federal government? ), with the IMF strong-arming countries like Greece and Ukraine into adopting its policy “recommendations.” Liberals used to be vehemently opposed to globalism (remember “Buy Local”?) and would bemoan the fact that the World Bank, the World Trade Organization, and the IMF have basically ravaged the entire Third World. No longer. It is now far more vital to drink Pepsi to “own the Nazis” than to realize that independently-minded leaders who reject the machinations of global finance must be removed and replaced with ones much more amenable to the IMF, WTO, and World Bank dictating policy in order to effectively control their nation’s economy. All the Left talks about is Harry Potter, White Privilege, and pan-sexuality. There’s no more talk about anti-war. There’s no more talk about the economic draft. There’s no more talking about working-class issues, no more talk about wage suppression. They are completely degenerate. They are lacking in any intellectual foundation or principled politics. They’re lacking in any positions of any worth…It’s really pathetic. Even worse, find a “progressive” cause, and there is a mega-corporation behind it. These corporations are so progressive, in fact, that billions of dollars are spent on their employees—from the public trough. That’s right, companies like Wal-Mart and Amazon pay their employees so little that a large percentage have to turn to public assistance to survive. In states like Arizona, one-third of Amazon employees rely on food stamps. Walmart’s abysmally low wages force workers to turn to public assistance to the tune of an estimated $6.2 billion in public assistance including food stamps, Medicaid, and subsidized housing. The American fast food industry represented a $7 billion drain in costs to taxpayers. And these rainbow-colored virtue-signalers are of course unanimous in their support for “progressive” policies—all while leaving the average American and the fast-shrinking middle class holding the bag. The global “free market” subsists on child labor and wage slavery, another state of affairs liberals of yore were once committed to combating. Now Nike with its sweatshop-made products has made Colin Kaepernick the face of its new advertising campaign. “Standing for something,” even if it means kneeling, might cost you everything—or it might just cost you next to nothing in labor expenses if you’re Nike. A more perfect match of vapidity and unprincipled charlatanry you may not find—unless it is those social media “YASSSS QUEEN BEY” feminists who find multi-millionaire and cuckoldress Beyonce to be the epitome of female empowerment. Beyonce, it should be mentioned, pays 54 cents an hour to the female sweatshop workers in Sri Lanka who make her Ivy Park clothing line. Mass unskilled and low-skill immigration depresses wages and leaves the bottom 50% of the economy—American-born Blacks and Hispanics and working-class Whites alike—vulnerable to competition and especially under-the-table, tax-free payments to illegal aliens who under-cut legal wage-earners. Besides, with increasing automation, we need more people why exactly? As the third-most populous nation on earth, if the United States can’t fill its labor needs domestically, what are the odds importing Senegal, Somalia, and Honduras is going to fix that? As more workers are displaced, as those who are employed are not even paid a living wage, as an increasingly cognitively-intensive economy renders a growing portion of the population unemployable, what kind of future are we creating for ourselves? Do we even have one at this rate? And what of a morbidly obese population straining the resources of our beleaguered healthcare system past the breaking point? Does Adult Onset Diabetes Woke Pepsi-Cola have anything to say on the matter? They do say that we should be “proud” of non-heteronormative sexualities/proclivities but not of our ancestors’ accomplishments. Smash the White male patriarchy but uncritically support an infinitely more repressive and regressive Islamic one. Be pro-globalist kleptocracy and function as the shock troops for the Establishment. Hasten your own civilization’s demise. Fetishize brown folks. On and on and circle the drain ever-downward. Globalization is all about wealth. It knows the price of everything and the value of nothing. Without borders the world will become—is visibly becoming—a howling desert of traffic fumes, plastic, and concrete, where nowhere is home and the only language is money. Between 1984 and 1991, Israel achieved a public-relations coup by importing tens of thousands of Ethiopians who claimed to be Jews. Over the last decade, however, Israel has been taking direct action to limit its Black citizens’ fertility…Also unsurprisingly, the Ethiopians have proved increasingly less popular with their Israeli neighbors, who have come to view them and their children as backward and crime-prone. Whether that is due to White Israelis’ racism or to the Blacks’ shortcomings is a matter of dispute…Most interestingly, since 2008 there has been evidence of a widespread resolve within Israeli society to drive down the fertility of its Ethiopian minority through forcefully persuading poorly educated Black women into accepting injections of the Depo-Provera contraceptive…In Israel, Ethiopian women have said on camera that Israeli immigration officials told them that they wouldn’t be allowed into the country without taking Depo-Provera shots. They claim to have been subsequently browbeaten into staying on the contraceptive. One study found that Ethiopian women account for 57 percent of all Israel’s Depo-Provera prescriptions…In contrast to Israelis, who obsess over demographics, Americans are never allowed to think about how proposed policies such as amnesty and guest workers will impact fertility, even though the current interpretation of the 14th Amendment grants instant citizenship to any child born in the US. We are all sharecroppers now; how many of us actually own homes and property outright, and how many are trapped in thirty-five-year mortgages or simply pay rent every month? How much do you pay in property taxes—effectively rent—on something you already own if you’re lucky enough to, in fact, own it outright? How many commute an hour-plus to escape the blast radius of all of that diverse cultural enrichment? Do you know why the levees in New Orleans broke during Hurricane Katrina? Not because of some nefarious White plot, but because New Orleans became a chocolate city and the Blacks simply stopped maintaining them. It is as simple as that. En masse they simply cannot be trusted to be stewards of our—or any—civilization. Left to their own devices, they do not create Wakanda, they create Haiti. Nevertheless, the toxic combination of excess self-esteem and constant anti-White provocations convinces Blacks and Browns they should be afforded privileges well beyond what they deserve, and Social Justice eagerly provides the Kool-Aid. Surely global disparities are the product of some nefarious collusion by Whites to clandestinely oppress the global coloreds they’re presently concerned with giving their countries away to, right? A fundamental quality of destructive criticism is its glorification of the primitive. Long before it elaborates specific revolutionary doctrines and methods, it blends with its condemnation of the present an idealization of what it conceives to have been the past. Rousseau was especially guilty of this in his idealization of the Noble Savage. We can see in this glorification of the primitive the Luddite impulse animating the cult of “climate change,” though only for the West as rapid industrialization and environmental degradation in China and India passes without comment. China is busy colonizing the entire planet and we are hung up on kneecapping our economies for the sake of one-tenth of a degree Centigrade. Trust me, given China’s record on not just the environment but human rights as well, this is not a positive development. But sure, let’s keep focusing on the Russian red herring. 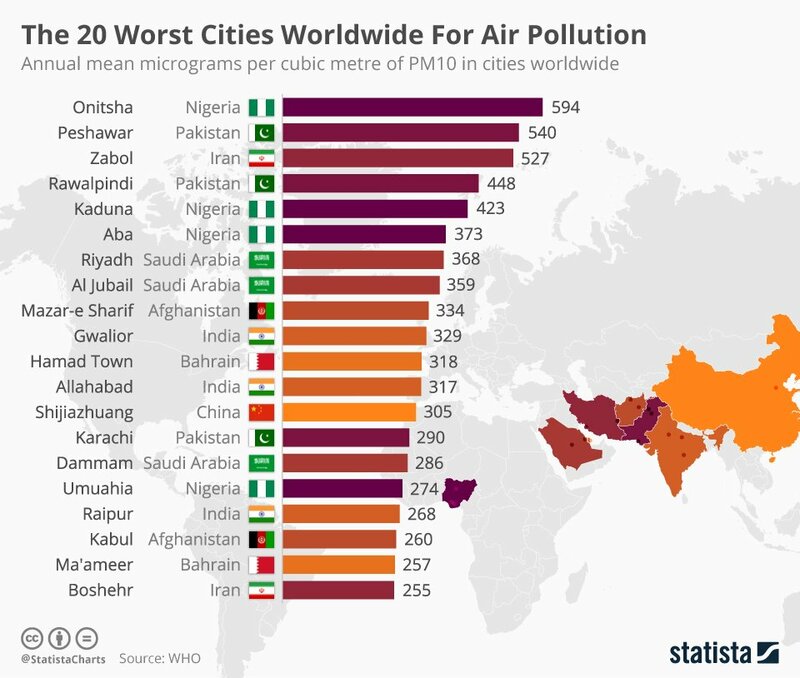 The twenty worst cities globally for air pollution are: Onitsha (Nigeria), Peshawar (Pakistan), Zabol (Iran), Rawalpindi (Pakistan), Kaduna (Nigeria), Aba (Nigeria), Riyadh (Saudi Arabia), Al Jubail (Saudi Arabia), Mazar-e Sharif (Afghanistan), Gwalior (India), Hamad Town (Bahrain), Allahabad (India), Shijiazhuang (China), Karachi (Pakistan), Dammam (Saudi Arabia), Umuahia (Nigeria), Raipur (India), Kabul (Afghanistan), Ma’ameer (Bahrain), and Bushehr (Iran). The nations with the highest levels of air pollution are: Saudi Arabia, Qatar, Egypt, Bangladesh, Kuwait, Cameroon, United Arab Emirates, Nepal, India, and Libya. The nations with the lowest levels of air pollution are: New Zealand, Brunei, Sweden, Australia, Canada, Finland, the United States, Iceland, Estonia, and Spain. The top five nations with the highest carbon dioxide emissions per capita are: Qatar, Kuwait, Bahrain, United Arab Emirates, and Trinidad and Tobago. The nations with the most deaths from air pollution are: Turkmenistan, Tajikistan, Uzbekistan, Egypt, China, Mongolia, Kazakhstan, India, Iraq, and Saudi Arabia. The nations with the fewest deaths from air pollution are: Sweden, Australia, Brunei, New Zealand, Finland, Cameroon, Iceland, Norway, the United States, and Spain. The twenty countries with the most polluted urban areas are: Pakistan, Qatar, Afghanistan, Bangladesh, Egypt, United Arab Emirates, Mongolia, India, Bahrain, Nepal, Ghana, Jordan, China, Senegal, Turkey, Bulgaria, Mauritius, Peru, Serbia, and Iran. The twenty countries with the least polluted urban areas are: Australia, Brunei, New Zealand, Estonia, Finland, Canada, Iceland, Sweden, Ireland, Liberia, Japan, Bhutan, Norway, Malta, Portugal, Spain, the United States, Monaco, Malaysia, and Luxembourg. According to the World Health Organization data spanning from 2008-2016, eleven of the twelve worst cities in the world for mean concentration of particulate matter in the air were in India, with the other in Cameroon. The majority of the top three hundred cities were found in China alone. 95% of the plastic waste that is choking our oceans comes from just ten rivers, eight of which are in Asia, while the other two are in Africa; among the primary offenders are the Yangtze River (727 million pounds of plastic waste per year), the Xi, Dong, and Zhujiang Rivers (233 million pounds), and the Ganges River, (1.2 billion pounds). China produces by far the most plastic waste that winds up in the world’s oceans—a whopping thirty times more than the United States! Lithuania, Latvia, Russia, and the United States have the strongest environmental democracy laws, whereas Belize, Cambodia, and Jordan have the worst. Countries such as Laos, Vietnam, Burma, Mozambique, Zambia, Indonesia, Tanzania, and Thailand are doing very poorly in their efforts to protect endangered species, as evidenced on the World Wildlife Fund’s scorecard. The demand for exotic animal parts, such as rhinoceros horn, is primarily driven by the Asian market, especially in China. According to Yale’s Environmental Performance Index, the top ten nations in the world for environmental stewardship and conservation are, in order: Finland, Iceland, Sweden, Denmark, Slovenia, Spain, Portugal, Estonia, Malta, and France. The bottom ten are: the Democratic Republic of the Congo, Mozambique, Bangladesh, Mali, Chad, Afghanistan, Niger, Madagascar, Eritrea, and Somalia as the worst. That whole global utopia without Whites? Try dystopia.